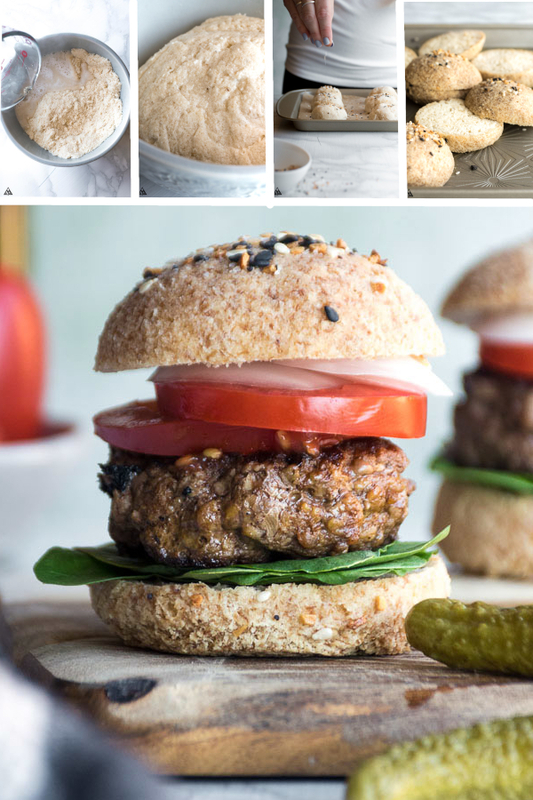 The BEST Low Carb Hamburger Buns — Dairy Free + Delcious! Why eat a boring old lettuce wrapped burger, when you could enjoy these fluffy and delicious low carb hamburger buns?? These low carb hamburger buns are absolutely fantastic, and exactly what every low carb foodie needs for their next BBQ, dinner party, or lunch! They’re versatile, tasty, and take 10 minutes to throw together. They’re vegan, store well in the fridge, and they taste just as good as the real thing! My friends, these low carb hamburger buns are where it’s at! And I’m so excited to share this recipe with you! Because I know you’re curious, there are roughly 26 grams of carbs in hamburger buns, due to the fact that they’re loaded with white flour and sugar. 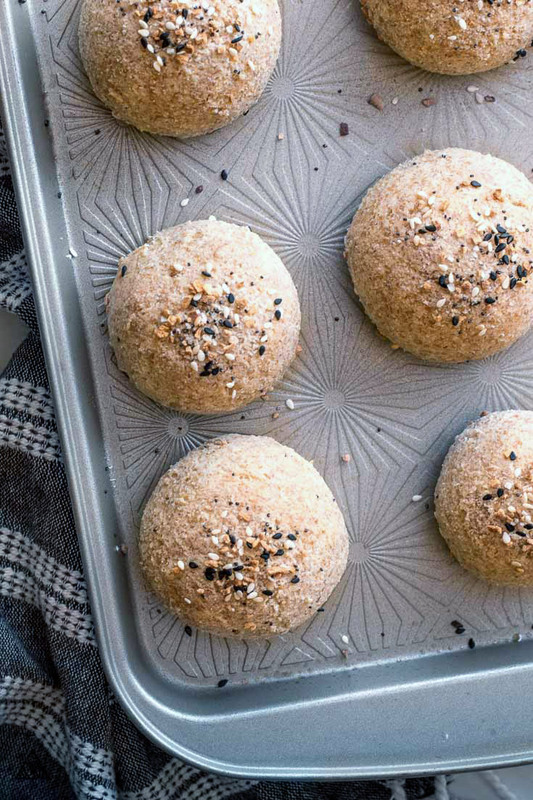 Instead of using white flour in this low carb buns recipe, we’re using almond flour — a delicious low carb flour made from ground almonds. 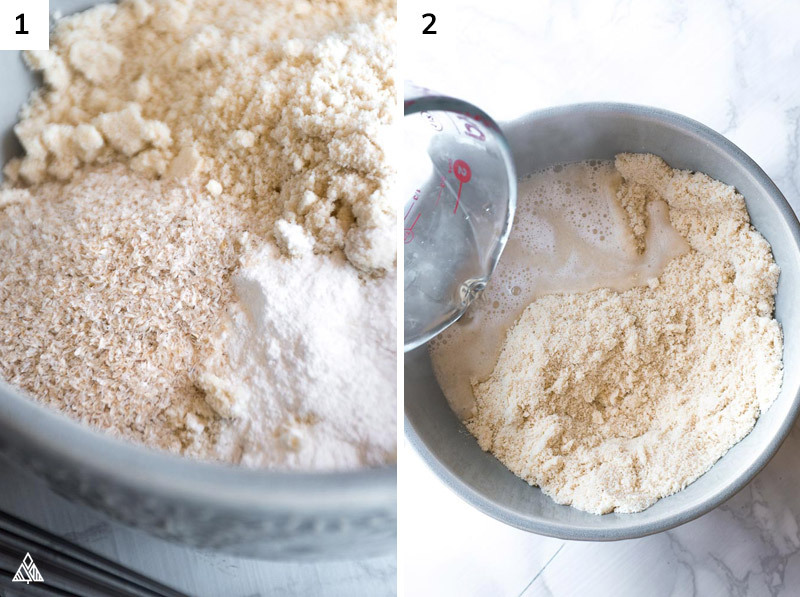 It’s super easy to bake with, has an awesome macronutrient breakdown, and a delicious taste — however it’s missing one little thing when compared to wheat flours: gluten. Gluten, the protein in wheat, plays a vital role in the bread making process: it’s in charge of binding, raising, and making bread more “bread like”. So, with any low carb bread recipe, we have to rely on an alternative. 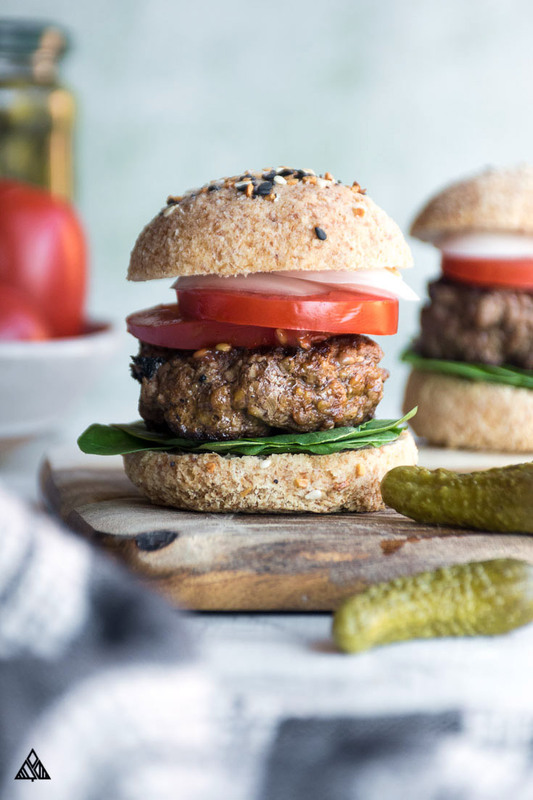 For these low carb hamburger buns, we’ll be using psyllium husk! This ingredient is extremely fibrous and works wonders in many low carb recipes! When it absorbs a liquid, it creates a gelatin, giving gluten free breads a bread like texture, while helping to bind the ingredients together. This is why these almond flour hamburger buns are so fluffy! If you don’t currently own it, I suggest buying some and storing it in your pantry for future low carb baking endeavours! 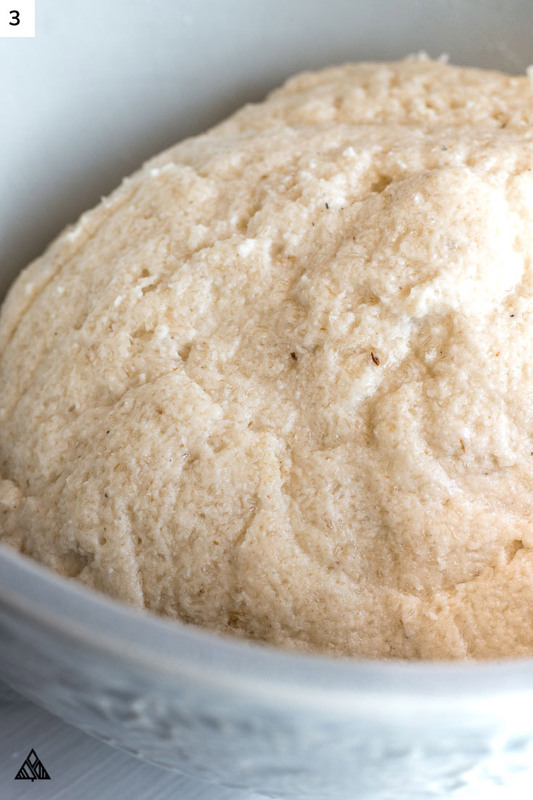 You’ll find most low carb bread recipes use this ingredient. One important note about psyllium husk, is that some brands will add a purple-ish color to the bread. I use this psyllium husk, and as you can see from the pictures, I haven’t had that issue! Although not required, there are a handful of delicious sprinklings you can use to top your low carb hamburger buns. For these buns, I used “everything but the bagel” seasoning from Trader Joe’s. 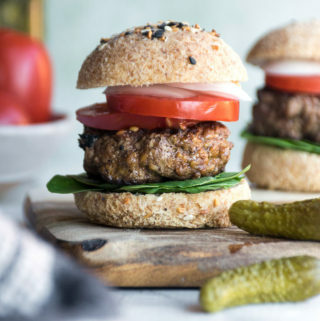 Sesame Seeds, Poppyseeds, Dehydrated Onion or Garlic are other delicious options — think of a seasoning to compliment your low carb hamburger recipe, and get wild! 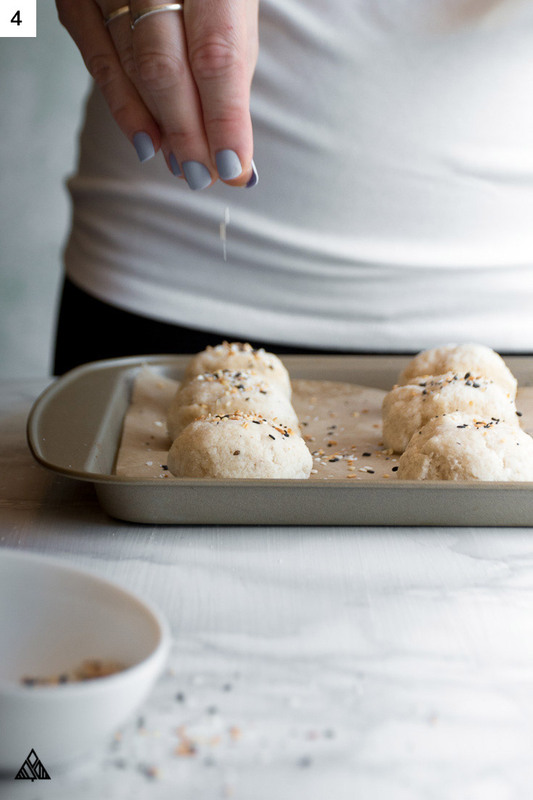 Don’t let the word hamburger stop you from getting creative with these delicious keto buns! You can literally stuff anything you’re craving inside! One of the biggest low carb meals requests I get is for low carb lunches — because let’s face it, lunch is a hard meal the prep for. If I’m speaking to you, then these low carb hamburger buns are what you’ve been looking for: Treat ‘em like sandwich bread by filling them with sliced meat and cheese. Or stuff ‘em with low carb chicken salad. I love making low carb breakfast sandwiches with these (bacon, a fried egg and cheddar cheese). Heck, they fluff up so nicely, why not serve them as dinner rolls?? In the photo, I used one of my favorite low carb hamburger recipes, use your favorite, try turkey burgers, grilled chicken, or any delicious concoction hot off the grill! I love using large portobello mushroom as a low carb burger bun alternative. Sliced tomatoes also work. You can also use oopsie bread or oopsie rolls. They’re absolutely delicious and make for the perfect low carb hamburger buns! Fathead hamburger buns are another cheesy choice. If you’re looking for low carb hamburger buns store options, check out the low carb hamburger buns walmart sells — they’re too high in carbs for me, but they may work with you low carb meal plan! When it comes to low carb hamburger buns Kroger even has an option! One final bit of information I’d like to impart before you get started: you have total flexibility in the shape and size of your low carb hamburger buns. Heck, I’ve even used this recipe to make low carb hot dog buns! Keep that in mind as you’re forming your the shapes on the baking sheet. If you’d prefer, flatten the top of your buns with your hand to make a wider bun that’ll fit a normal sized burger, or you can break this into fewer portions! The dough will rise slightly, but it doesn’t seem to “grow” (get wider). What you plop onto the baking sheet is pretty much what you’ll get! So excited for you to try these low carb hamburger buns! Leave me a comment below and let me know how you enjoyed them. Why eat a boring keto lettuce wrapped burger, when you could enjoy this fluffy and delicious low carb hamburger buns recipe made from almond flour instead?? Pour apple cider vinegar and the boiling water over dry ingredients and stir to incorporate using a spatula. Let the dough sit for a few minutes, this will allow the psyllium husk to soak up the water. Then cut the dough using your spatula into 6 pieces. Baking for 60 minutes, or until cutting through the center of the bun, it is cook through and no longer “doughy”. You have total flexibility in the shape and size of your low carb hamburger buns as you're forming the shapes on your baking sheet. The dough will rise slightly, but it doesn't seem to grow wider when baking. What you place on the baking sheet is what you'll get. Nutritional information is based on 1 bun, if you make 6 buns with this recipe. Mine came out brown and gummy inside. Did not look light like yours. And I o my got 5 not 6. What did I do wrong? Disappointed please answer.